My boys love television and the youngest especially loves anything on Nick, which includes a new favorite of his: Team Umizoomi! 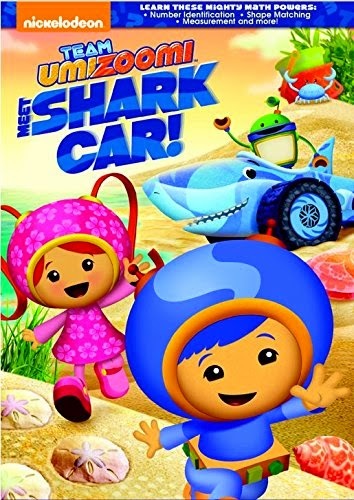 We recently received and awesome DVD from them titled Meet Shark Car, and it has become a favorite in our van for car rides. This 91 minute DVD has brought lots of pleasure to my youngest son, and he especially love the part where there is a Stompasaurus because dinosaurs are also a huge thing in my house! Team Umizoomi plays weekday mornings at 10am and you can view printables and more at the Nick Site! Of course, what this Mama loves most about Team Umizoomi is the fact that they teach math in a FUN way to preschoolers! The show helps with shapes, number identification and meausuring! This awesome DVD Meet Shark Car is no exception and can be purchased for less than $10 with free shipping through Amazon. My grand kids would like this. It looks cute.